I first became interested in comics scholarship in the summer of 2011. 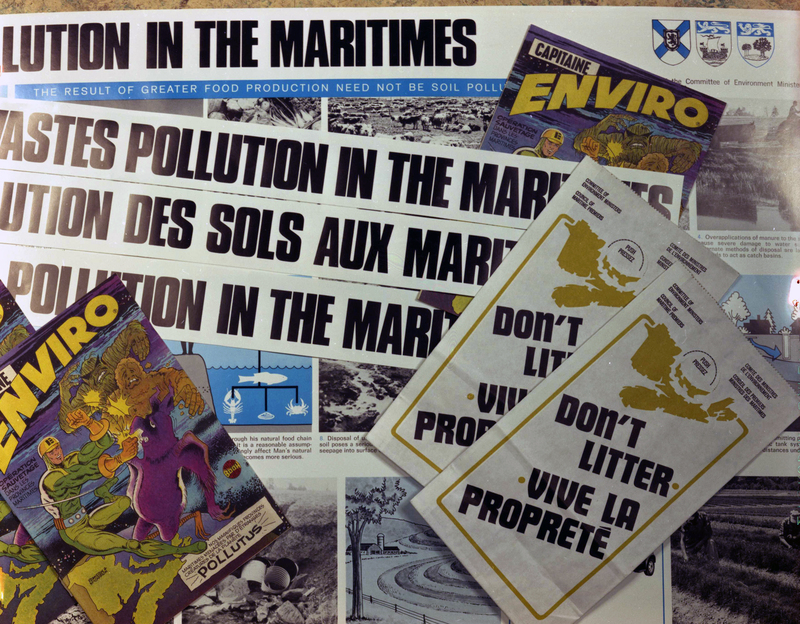 While conducting research at the Provincial Archives of New Brunswick, I came across a photograph depicting some of the environmental literature distributed by the New Brunswick government in the mid-1970s. What immediately caught my eye was a French-language comic book titled Capitaine Enviro. Intrigued, I went back to my office and started searching the Internet for clues as to the comic book’s origins. I had no way of knowing at that point in time that I had just stumbled upon a whole new (to me) area of historical research. The photograph that originally got me interested in comics scholarship (Provincial Archives of New Brunswick P366-1051). Over the next few years, my forays into comics scholarship kept getting bolder. At first, I simply incorporated comics images into conference presentations, guest lectures, and my own teaching, often using the aforementioned Captain Enviro comic (see the full Captain Enviro comic book here). As I became more comfortable with the subject matter, I gave a conference presentation in Toronto in the spring of 2013, workshopped a paper at the 2013 meeting of the Northeast and Atlantic Canada Environmental History Forum, and last summer published an article in the journal Material Culture Review. A couple of years ago, I even started daydreaming about the possibility of one day being in the position where I could create an undergraduate course that combined history and comics. The course is currently structured to unfold over 15 weeks, with a three-class-per-week schedule. The first three weeks will serve as an introduction to the field of comics studies (history, form, and culture), while the following 12 weeks will focus on some of the major topics and themes in history. It’s in this second part of the course when the interplay between history and comics really begins: “When we enter the portion of the course focused on various topics and themes in history (weeks #4-15), the first class of the week will be a contextual lecture of that week’s topic or theme, the second class will be an examination of how that topic or theme has been dealt with in comics over time, and the third will be a discussion of specific examples of comics.”Students will be introduced to a “wide and varied selection of subject matter,” including politics and political discourse, armed conflicts and mass atrocities, nature and the environment, Indigenous peoples, labour and the working class, and the LGBTQ community. 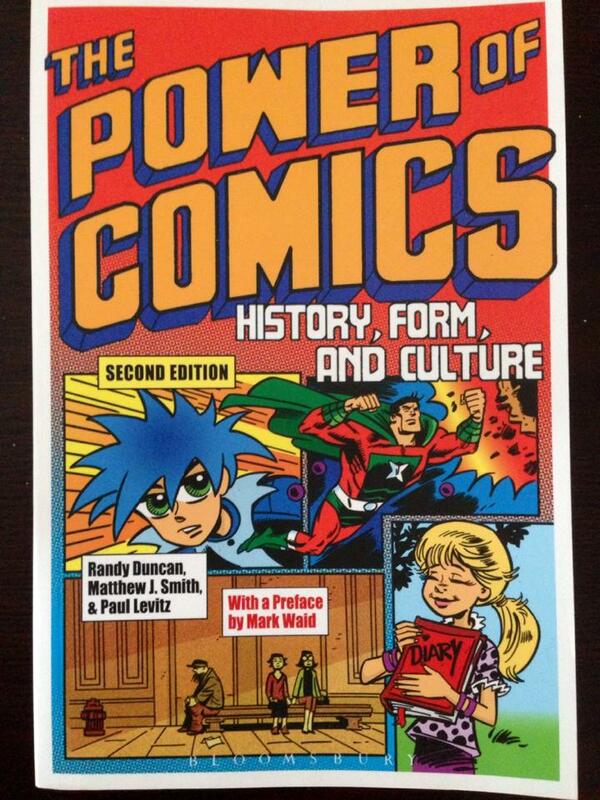 The textbook for the comics studies section of the course. All of this is to give you a basic sense of the course. However, for those who are interested, a PDF copy of the course syllabus is available below. If you have any ideas or suggestions, please send them along. The course will be going in front of the undergraduate curriculum committee later this fall. It’s still in the early stages, but if approved, it is my hope that “History and Comics” will grow with me as I become even more acquainted with the comics medium and comics scholarship.